In the past, many atheist critics assumed the New Testament writings, biblical names, places, and events were invented by the apostles and were phony. Skeptical bible scholars even attacked some gospels asserting they were written after the second century by an unknown author. Nowadays, more and more archaeological discoveries are made confirming the Gospel accounts of people and places recorded in the New Testament such as Caiaphas, Pilate, and the first-century Nazareth. The life of Jesus is described primarily in the four canonical Gospels of the New Testament Bible that were written by Matthew, Mark, Luke, and John. Jesus presented there as a teacher, healer and then as a perfect sacrifice for the redemption of the souls. During the 150 years of Jesus’ life, nearly 42 authors mentioned him in their writings, including nine non-Christian sources. Researchers have discovered thousands of historical writings that mentioned Jesus’ existence as well as numerous archaeological findings that confirm 50 real people in the Bible. Both secular and religious historians acknowledge that Jesus Christ has influenced the first-century and modern world more than any other person. Some New Testament scholars believe that the first generation of Jesus’ followers certainly knew what Jesus looked like and his other personal information, but did not record it. Furthermore, the second of the Ten Commandments prohibited creating artwork, idols, or icons that represent living beings or celestial objects. The Talmud prohibited producing images of faces and considered it forbidden. Only non-Jews had a permission to create images of faces (source: Avodah Zara 43a). Many Hebrews such as the apostle Paul were mistaken to be Egyptians (Acts 21:38). 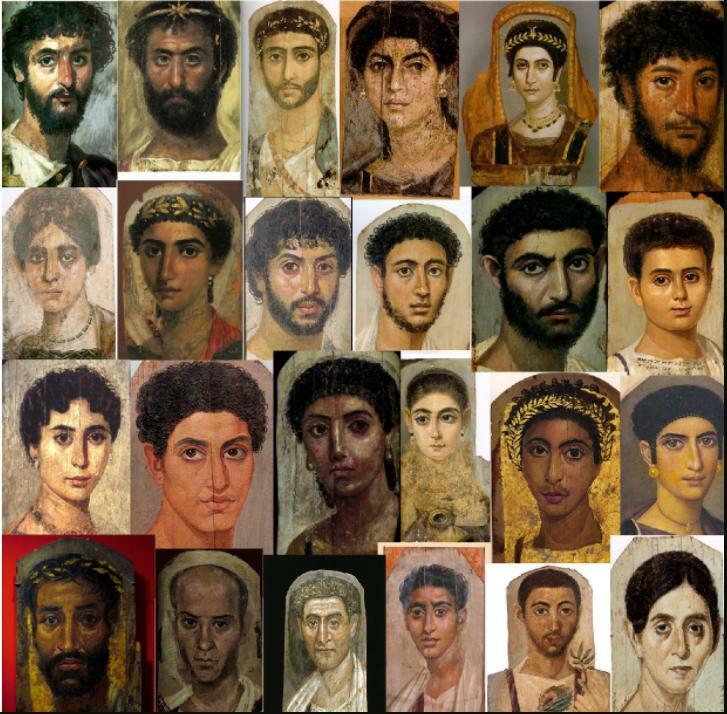 Since it was not restricted for Egyptians to create artwork of faces, they created plenty of valuable historical records of their looks. Jesus was born in Bethlehem, during the reign of Herod the Great (Matthew (2:1)). According to the gospels, his mother Mary had a virgin birth and her lineage can be traced back to the house of David. Joseph was a corporeal father of Jesus and the gospels describe Joseph as a "tekton" or "carpenter”. It is possible that Joseph taught his craft to Jesus while living in Nazareth, a village in a lower Galilee. Lower Galilee where Jesus lived was the lushest region in Israel. The place was sunny with pleasant subtropical climate and spring-watered lands. The place was full of blossomed trees and wildflowers, vineyards and fruit orchards. Jewish historian Flavius Josephus knew this area very well and described it as beautiful and wonderful (The Jewish War, Book 3, Chapter 10:8). The typical villages from a first-century Judea contained many mud brick houses with a courtyard and two rooms – a front, public room with an awning, and a private room behind it. The houses were quite comfortable and minimalist inside and had a flat roof with exterior stairs that was covered by the awning of woven goats’ hair to protect against the sun. Very often the women used this as an extra room and a workspace. Houses and chambers were small in size, not more than five meters across, and taller men had to stand down to go in. This is a good indication that Jesus was not taller than 5’6. The Nazareth was so small and insignificant place that it wasn’t mentioned in any surviving literature until after the time of Jesus. Until 2009, there was no tangible evidence that Nazareth village or town existed during the first century. Some skeptics even celebrated this notion and declared that evangelists invented everything. But it was not the first time something was found related to the place of Nazareth. The archaeological digs in 1955 revealed first-century tombs surrounding Nazareth village. According to the Jewish law, burials had to take place outside the town. Two tombs were found with various pottery lamps, vases and glass vessels from the first, third or fourth centuries. Archaeologists came to a conclusion that the first-century Nazareth was an agricultural settlement with numerous caves for storing grain, olive presses and cisterns for water and wine. It was a confirmation of the gospels that this city has existed during the time of Christ. Today, “Nazareth” place exists an Arab city of 65,000 in northern Israel. According to the New Testament, Jesus had brothers and sisters. His brothers were Joseph, James, Judas, and Simon with James being martyred in AD 62. It is unclear they were Jesus’ biological siblings or children of Joseph from a previous marriage. The ossuary was confirmed to be authentic in 2012 by two eminent paleographers after the seven-year “forgery trial of the century” with the Israeli antiquities collector and the owner of ossuary Oded Golan. However, debates are still going on till this day. Capernaum is a city where Jesus ministered. There are sixteen known references to Capernaum where Caper means “village” of Nahum. Archeologists excavated houses in a shape of one-story buildings with a staircase placed outside to access the flat roof that was made of wooden beams or branches coated with mud. This discovery confirms Mark 2:1-4 where four men carried a sick man onto the roof to let the man down in front of Jesus for a healing. In addition, the synagogue in Capernaum where Jesus had healed the slave of a Roman officer was also found confirming Mark 1:21-22, Luke 4:31-36 and Luke 7:1-10. In the synagogue, Jesus healed the slave of a Roman officer. The samples for the archeological testing were extracted from a foundation of the synagogue made of black basalt and the pottery beneath the floor. Some scholars interpret word “gods” as judges. However, Jesus said specifically that he is Son of God, not a son of a judge or that he and the judge are one. He called them “Ye are gods” to whom “the word of God came”, where word “gods” really means “Sons of God”. “…when the morning stars sang together, and all the Sons of God shouted for joy” (Job 38:7) and “And out of one of them came forth a little horn, which waxed exceeding great, toward the south, and toward the east, and toward the pleasant land. And it waxed great, even to the host of Heaven; and it cast down some of the host and of the stars to the ground, and stamped upon them” (Daniel 8:10). Due to the limited understanding, Jews assumed he was saying blasphemous things by calling himself God. As a result, they made various accusations against him leading to his crucifixion. There used to be no tangible evidence that the Roman governor Pontius Pilate and the Jewish priest Joseph Caiaphas ever existed. Both of them were the main officials present in the trial and making decisions regarding the crucifixion of Christ. In 1961 archaeologists discovered a block of milestone that had the name “Pontius Pilate Prefect of Judea” words written on it. Then in 1990 ossuary (bone box) was found that had an inscription of Caiaphas. It was confirmed to be authentic by the mainstream archaeologists. According to the Jewish tradition in the first century AD, the bones of the deceased have to transport from burial caves to limestone boxes called ossuaries one year after their death. The tradition was changed shortly after the destruction of the Jewish temple in 70 AD. The skeptical scholars used to argue that the crucified corpse of Jesus was buried in a shallow grave reserved for executed criminals. In 1968 building contractors unexpectedly uncovered an ancient burial site with 35 bodies in Giv’at ha-Mivtar, a Jewish neighborhood in northeast Jerusalem. These were the bones of two generations of a family who lived in the century before the time of Jesus. One person was identified as Yohanan Ben Ha’galgol, being around 24 and 28 years old. His bones were kept in an 18-inch long limestone ossuary (bone box). He had a 7-inch nail driven through his both feet. The fragments of olive wood were found on the nail that identified the type of wood of the cross he was hanged. Yohanan’s legs were crushed by an object like Roman “crucifragium” (John 19:31-32). This important archaeological discovery matches the gospel account and confirms that people were buried properly after the crucifixion per Jewish tradition. The tomb is located in the Church of the Holy Sepulcher in Jerusalem’s Old City and suggests the actual site of the crucifixion, the burial and the resurrection of Jesus. The National Technical University of Athens opened the tomb for the first time in centuries in October 2016 to conduct a restoration on the shrine project. Many believe that the tomb contains a long burial bed where the body of Christ was placed after his crucifixion in around 30 AD. According to the National Geographic, researchers explored the limestone samples of the tomb by using optically stimulated luminescence (OSL) tests. The tests reveal they were 1,7000 years old and dated to the imperial Roman era. The pieces of mortar taken from the burial bed and a marble cover dated back to 345 AD. There were people who assumed that the disciples stole Christ’s body. However, grave robbery was an extremely serious crime equal to the capital offense. Anyone conducted a grave robbery or any other type of crime was punished severely. The type of punishment included crucifixion. It was highly unlikely already fearful and tired disciples would risk doing this type of crime. Shroud of Turin is a burial cloth 13 feet long and three feet wide. It was damaged through the centuries including the damage by fire. There is a visible image of a man’s face and body with bloodstains. It was dismissed as fake after the 1988 carbon dating tests detected a medieval period of time. However, recent scientific research found tests to be unreliable due to the wrong samples being tested, e.g. the tests were done on threads from the patches used to repair the shroud after the fire damage. Raymond N. Rogers, the author of ‘Studies on the Radiocarbon Sample from the Shroud of Turin’ book, calculated it to be 1,300 to 3,000 years old and from Jesus’ time period. Padua University scientists conducted another radiocarbon dating tests in early 2013 and confirmed that the Shroud was made around 280 BC and 220 AD. Another study done by the Hebrew University concluded that pollen and plant images on the shroud showed it originated in the area around Jerusalem sometime before the eighth century. The shroud carries undisturbed bloodstains and provides additional evidence that it is a genuine 1st-century artifact that serves as archaeological evidence of Jesus’ crucifixion. And finally, Barbara Frale, a researcher at the Vatican archives used computer-enhanced images of the shroud. She detected faintly written words in Greek, Latin, and Aramaic that include the name "(J)esu(s) Nazarene" — or Jesus of Nazareth — in Greek. In her book, "The Shroud of Jesus Nazarene," she explains that those people who were buried in the public grave were marked by words for identification. Archaeological findings serve as independent evidence for places, people, cultural practices and beliefs mentioned in the New Testament. It validates the historical character and reliability of the Gospel texts, fills in background details for the narratives in both the Gospels and in the book of Acts. The archaeological discoveries provide an actual proof that the gospels are correct historically and its names and places have been verified many times.